Rodrigo Rosenberg left a video blaming Guatemala's president after his death last year. (CNN) -- A lawyer who left a videotape saying Guatemalan President Alvaro Colom would be responsible if anything happened to him masterminded his own death last year, a special United Nations commission said Tuesday after an eight-month investigation. Colom had nothing to do with the killing, said Carlos Castresana, head of the International Commission Against Impunity in Guatemala. "Rodrigo Rosenberg, for some reason, decided to put an end to his life," Castresana said at a televised news conference. Rosenberg was shot from behind in a brazen daylight attack while riding his bicycle in Guatemala City, the nation's capital. He was shot three times in the head, once in the neck and once in the back, Castresana said. Prominent Guatemalan brothers Francisco Jose Valdez Paiz and Jose Estuardo Valdez Paiz hired hit men at the behest of Rosenberg, who told them he was being threatened by someone, Castresana said. The two brothers, who own a pharmaceutical company, had been cousins of Rosenberg through a previous marriage and did not know that he was the target of the assassination, Castresana said. Rosenberg fed information to the hit squad leader that led to his own death, giving descriptions of what the target looked like and where he would be. "It was the two brothers and no one else," Castresana said. "Not a politician. Not a [government] minister. Not a police chief. No one. Just these two brothers." About 300 investigators from 11 nations reached their conclusion after an exhaustive examination of 100,000 telephone calls, 9,500 documents, surveillance videotapes, and 135 interviews with 11 suspects and others, Castresana said. Colom had maintained since the May 10 slaying that he was innocent despite Rosenberg's explosive videotape, which was made public the day after his death. Guatemalan authorities have arrested 11 men on suspicion that they carried out the killing, but the Valdez Paiz brothers remain at large. Their lawyer, Alexis Calderon, denied last week that his clients were involved. "This is a story being made up to implicate people who didn't have anything to do with it," Calderon said. He also said that he did not know where the brothers were but that they would surrender after Tuesday's conference. Calderon did not answer calls seeking comment Tuesday. Arrest warrants for the brothers were issued December 10, Castresana said, noting that the suspects were already out of the country by then. 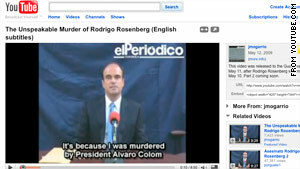 Rosenberg recorded the tape blaming Colom three days before his death. He said Colom wanted him dead because the lawyer had been blaming the president and some of his top associates for the slaying of a prominent businessman and his daughter the previous month. Businessman Khalid Musa and his daughter, Marjorie, were killed, Rosenberg said, because they had refused to participate in acts of corruption as the president wanted. Castresana indicated Rosenberg staged his own killing to get back at Colom and high-level members of his government, whom he could not prove were responsible for the Musa killings. "He wanted to open a box of lightning and thunder," said Castresana, a Spanish judge. Castresana pointed to several indicators of Rosenberg's state of mind: His mother had died; he was going through a second divorce, and his wife had taken their young children to Mexico; he was bereft at the slaying of Marjorie Musa, with whom he had a close relationship; and he felt a sense of powerlessness because he could not prosecute the people he believed were responsible for the Musa slayings. May 10, the date of his killing, was Mother's Day. In two April 21 e-mails, seven days after the Musa killings, Rosenberg wrote, "I can't stop crying" and "I feel like I'm disintegrating," Castresana said. Rosenberg made out his last will and testament on April 24 and started going public with his accusations against Colom regarding the Musa slayings on May 3. On May 4, he called a meeting at his law office and said he would be leaving the firm, in which he was a partner. The next day, Castresana said, Rosenberg asked a friend to buy two cell phones anonymously. Those cell phones, the lead investigator said, were crucial to cracking the case. Rosenberg used one of the phones to call threats to his personal cell phone and had the other delivered to the Valdez Paiz brothers, who gave it to the hit squad leader. Rosenberg then used the new cell phone he kept to give instructions to the hit squad leader through the second phone, Castresana said. Castresana detailed how the slaying apparently was meant to be paid through a $40,000 check. According to the investigator, Rosenberg told his secretary before his death that she would be receiving a check from Panama that should be delivered to the Valdez Paiz brothers. The check had been made out by Luis Alejos, a Rosenberg friend and business associate who at the time was Guatemala's minister of communication, Castresana said. Alejos resigned from office in June, a few weeks after the slaying. After receiving the check, Francisco Jose Valdez Paiz destroyed it, Castresana said. The businessman paid the 300,000 quetzales ($35,900) for the assassination out of his own pocket, Castresana said. The investigator said Rosenberg sent Alejos the money to pay for the killing. Alejos is the brother of Roberto Alejos, the president of the Guatemalan Congress, and a cousin of Gustavo Alejos, who is President Colom's private secretary. In his videotape, Rosenberg said Gustavo Alejos would be among those responsible for the lawyer's death if it happened. "If you are reading this message, it means that I, Rodrigo Rosenberg Marzano, was murdered by the president's private secretary, Gustavo Alejos, and his associate Gregorio Valdez, with the approval of Mr. Alvaro Colom and [first lady] Sandra de Colom," Rosenberg said. After the tape surfaced, Colom went on national TV with a vehement denial that he or anyone mentioned in the video was involved. He expressed his sense of vindication in a televised speech Tuesday afternoon. "I don't have any rancor in my heart," Colom said. "Just immense gratitude for those who waited patiently with us." The United Nations established the International Commission Against Impunity in Guatemala in 2006 to investigate corruption and political violence. More than 200,000 people have been killed in the nation since 1970, mostly as a result of organized crime, drug-trade violence and a 36-year civil war that ended in 1996. There were 6,451 slayings in Guatemala last year, of which only 230 verdicts were achieved, Castresana said. That means, he said, that more than 96 percent of the killings in 2009 were not solved.